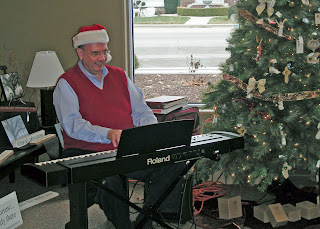 BMH Publisher Terry White took a break this afternoon to provide Christmas music at the Tree of Life Bookstore, located adjacent to the BMH offices at 1104 Kings Highway, Winona Lake, Ind. If you are in the area, he’s playing until 3 p.m., and again tomorrow (Saturday) from 10 a.m. until noon. Hey Terry! I like the Santa's hat and I wish we could be there to enjoy the Christmas music. Have a very blessed Christmas season!